St. Thomas Aquinas Catholic Church of South Philadelphia is celebrating 125 years of serving the community. With a full operating parish, grade school and day care, many generations have been affected by the church in one way or another. Rev. Herbert Sperger has been the pastor of St. Thomas Aquinas for four years. He describes South Philadelphia as a small town where he is constantly meeting people whose lives revolved around the school for many year. One longstanding member of St. Thomas Aquinas, Frank Diodato, grew up across the street from the church. 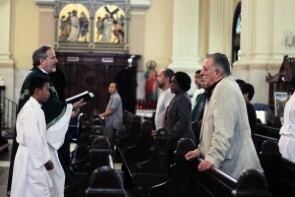 Diodato has been a member of the parish since 1937. “I love every minute of it,” said Diodato, who is a Eucharist minister. Diodato is at the church nearly every day working to serve in some capacity. He recalls some ways that the parish has served the community in the past. “We’ve had Christmas parties for nuns, Christmas parties for children from all different parishes,” said Diodato. Rev. Arthur Taraborelli was the pastor before Sperger. He is held in high regard by members of the church who knew him. After Taraborelli died in 2006, Sperger “picked the ball right up,” according to Diodato. “Father Herbert [Sperger] is one of the finest priests I’ve met here,” he said. He praised Sperger for his business sense and believes he will help the church prosper. In addition to the church, the school was created in 1885. It now services 230 from pre-kindergarten to eighth grade. The parish also has a day care facility to service the parents in the neighborhood. “We’re struggling in a low-income community to try to help the parents to find the resources the need to provide for their children a better future by means of education,” said Sperger. Sperger and other members have worked hard to improve the school. They have upgraded the technology in the school. It also provides language, math and reading programs among other services. Toni Nichelson is a Eucharist minister who has taught in both the grade school and the day care. 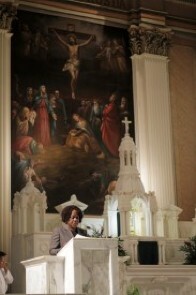 Nichelson is also a member of the Community of Black Catholics. She wishes to see more community members join the church and a growth within the black community. The Community of Black Catholics is a group that has services on selected Sundays and invites people to worship with them. They also provide refreshments at the end of their service. The church offers various services in English, Spanish, Vietnamese and Indonesian. Country flags dangle below the balcony where the organist plays. Saints from various countries are present around the sanctuary. Diversity even exists in the physical scenery of the church. Left over from the Irish influence, St. Patrick and Brigid of Ireland are displayed on the walls on the front of the church. 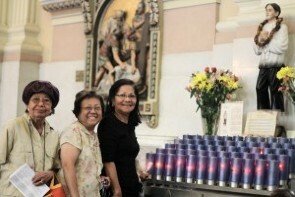 Around the church one can pray to St. Lorenzo Ruiz, who is the first Filipino saint. 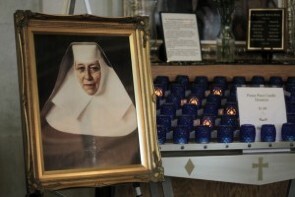 There is Mother Katharine Drexel, founder of the Blessed Sacrament for Indians and Colored People mission. 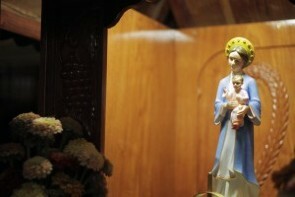 Lady of La Vang, who is esteemed within the Vietnamese community, and St. Martín de Porres, who is representing the mixed raced, are both present among various other saints. With this current diversity in the congregation, there is always a curiosity of what new culture will join the community. Sperger wishes that the new influx of people that will come to find St. Thomas Aquinas to be a welcoming church. To support the congregation and to provide the services necessary for the population that will come, there needs to be finances available. St. Thomas Aquinas had a program called “scrip” to help the parish, in which a scrip can be purchased for the local ShopRite. By shopping, a portion of the proceeds will go to the parish. “I hope that we will continue to find resources and welcome new people who will come from some where else,” said Sperger. This article was written and reported by Keisha Frazier and Lisa Wilk for Philadelphia Neighborhoods, a publication of Temple University's Multimedia Urban Reporting Lab, and originally published on Sept. 29, 2010.